In February 1832, Felicia Hemans, at that time Britain’s most popular and widely read poet, published in Blackwood’s Edinburgh Magazine a short poetic drama entitled “The Painter’s Last Work.—A Scene,” confiding in a conspicuous footnote that the piece was “suggested by the closing scene in the life of the painter Blake; as beautifully related by Allan Cunningham.” Though Cunningham’s early sketch of Blake in The Lives of the Most Eminent British Painters, Sculptors and Architects1↤ 1 6 vols. (London: John Murray, 1830) 2: 140-79. has received attention from almost all of Blake’s biographers, Heman’s poem has been entirely overlooked; though it was frequently reprinted throughout the nineteenth century in dozens of British and American editions of Hemans’s Poetical Works and was, therefore, a far more widely disseminated account of Blake’s death that Cunningham’s, modern scholars have been unaware of it, in part because Hemans’s complete Works have not been reprinted since they last appeared in an Oxford University Press edition in 1914. 1. 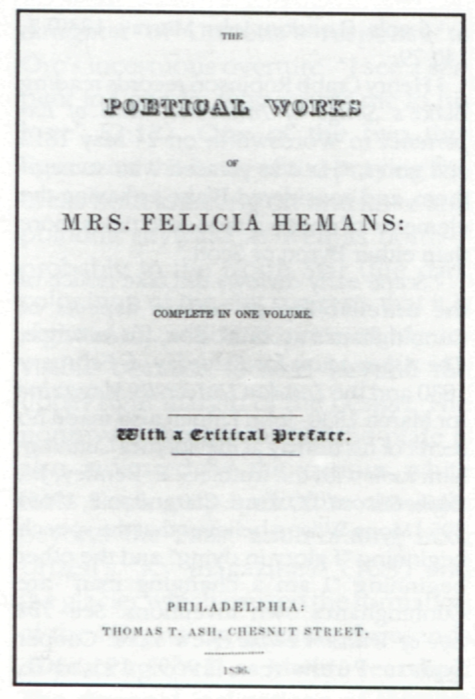 Felicia Hemans (1828). Engraved by Edward Scriven after a portrait by William E. West. 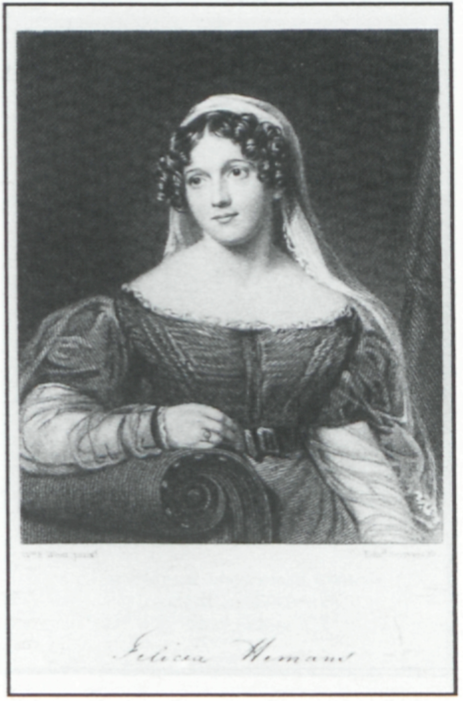 Harriet Hughes, the poet’s sister, used this engraving for the frontispiece to her 7-volume, 1839 edition of Hemans’s Works. He had now reached his seventy-first year, and the strength of nature was fast yielding. Yet he was to the last cheerful and contented. “I glory,” he said, “in dying, and have no grief but in leaving you, Katharine; we have lived happy, and we have lived long; we have been ever together, but we shall be divided soon. Why should I fear death? Nor do I fear it. I have endeavoured to live as Christ commands, and have sought to worship God truly—in my own house, when I was not seen of men.” He grew weaker and weaker—he could no longer sit upright; and was laid in his bed, with no one to watch over him, save his wife, who, feeble and old herself, required help in such a touching duty. The Ancient of Days was such a favourite with Blake, that three days before his death, he sat bolstered up in bed, and tinted it with his choicest colours and in his happiest style. He touched and retouched it—held it at arm’s length, and then threw it from him, exclaiming, “There! that will do! I cannot mend it.” He saw his wife in tears—she felt this was to be the last of his works—“Stay, Kate! (cried Blake) keep just as you are—I will draw your portrait—for you have ever been an angel to me”—she obeyed, and the dying artist made a fine likeness. The very joyfulness with which this singular man welcomed the coming of death, made his dying moments intensely mournful. He lay chaunting songs, and the verses and the music were both the offspring of the moment. He lamented that he could no longer commit those inspirations, as he called them, to paper[.] “Kate,” he said, “I am a changing man—I always rose and wrote down my thoughts, whether it rained, snowed, or shone, and you arose too and sat beside me—this can be no longer.” He died on the 12th of August, 1828,4↤ 4 Blake died in 1827, and was 69, not 71. without any visible pain—his wife, who sat watching him, did not perceive when he ceased breathing. Proficient in Italian, Hemans probably set her poetic drama in Italy because of her great admiration for Italian art and literature.6↤ 6 One of her earliest books was The Restoration of the Works of Art to Italy: a Poem, 1816. It seems likely that she gives the Italian name “Francesco” to the William Blake character to underline his frankness, sincerity, and openness (“franchezza”), to suggest the spiritual freedom he embodies, and perhaps to point towards the reassurance he gives his wife (“francheggiare”). Similarly, it appears she names the Catherine Blake character “Teresa” to suggest at one and the same time the earthly region (“terra”) she must continue to inhabit and her fear (“terrore”) of approaching widowhood. Following is the text of Hemans’s dramatization of the death of Blake as it was first published in 1832. It is worth quoting in its entirety because all subsequent appearances reprint a substantially revised, inferior text. Scene—A Room in an Italian Cottage. The Lattice opening upon a Landscape at sunset. The fever’s hue hath left thy cheek, beloved! Are clear and still once more. Wilt thou look forth? All burning bronze, the lake one sea of gold! The rich air fill’d with wandering scents and sounds? On this true bosom, lulling thee to rest With vesper hymns? 2. Title page to the first of Hemans’s books to include “The Painter’s Last Work,” a poem about the death of Blake. This 1834 version differed significantly from the text that appeared two years earlier in Blackwood’s Edinburgh Magazine. Back on my soul in mastery!—one last work! All, all, in that memorial. Like passing music from the lute;—dear friend! To call me hence. Oh! be thou not deceived! Bind to thy heart no earthly hope, Teresa! As thou hast still been gentle! My only sunshine!—How can I bear on? Is not of things to perish. And lowly thought—even thus—my own Teresa! But how much rests unbreathed! My faithful one! Too long, too bitterly, when I depart! 3. “The Painter’s Last Work” appeared in this 1836 American edition of Hemans’s Poetical Works and in dozens of other collections published throughout the nineteenth century on both sides of the Atlantic. Blake character, with his verbal tribute to Teresa, is as much poet as painter. It is hard to escape the implicit parallel between the portrait drawn by the dying Blake and Hemans’s own creative act, here and elsewhere, of foregrounding and celebrating the quiet dignity and heroism of women. In fact, Francesco’s chief virtue would seem to be his capacity for appreciating Teresa’s enormous worth and his skill in immortalizing her in art, even on his deathbed.7↤ 7 Disconcertingly, life has a way of imitating art. Only three years after the first publication of “The Painter’s Last Work,” Hemans was herself dying, writing until nearly the end. Biographers and contemporary readers would make much of her last poem, “Sabbath Sonnet,” dictated from her deathbed, amid fever and delirium. God shall assuage thy pangs when I am laid in dust! Weep, weep not thus, belov’d! Of soothing to the last!—Mine own Teresa! Which hath kept ours from withering.—Kneel, true wife! begin page 72 | ↑ back to top Nor wandering thought. We thank thee, gracious God! And in Thy heavens, immortal!—Hear our prayer! This melodramatic prayer of thanksgiving changes the final emphasis of the poem from a celebration of Catherine/Teresa to a more conventional celebration of God the Father—from a matriarchal to a patriarchal vision, from the human to the divine. The painter/poet now becomes priest as well. Hemans revises Cunningham’s construct this second time to reflect the way in which her own agenda and notion of her poetic role had changed toward the end of her life. But in both of her retellings, Blake is neither the wild eccentric nor the mad painter, but a sensitive, generous, and talented artist/poet with a nobility of spirit and an enormous capacity for love. 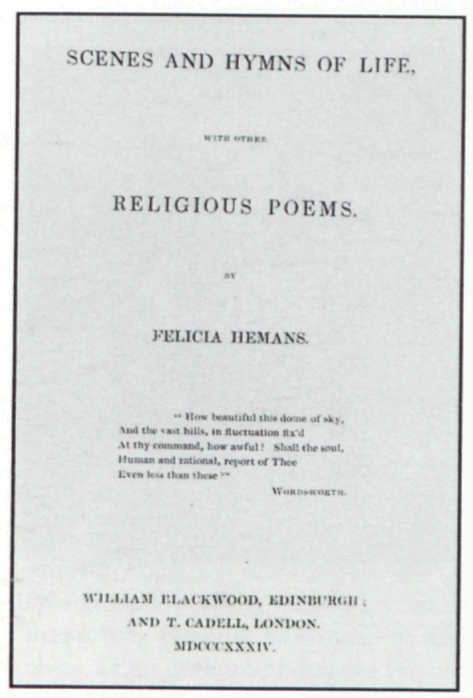 That Felicia Hemans, a poet who probably sold more books than Byron, identified with Blake and mythologized his death in such a positive way to a large general reading public only four and a half years after the event, suggests that the story of Blake’s early posthumous reputation may be far more complex and interesting than biographers have so far acknowledged.